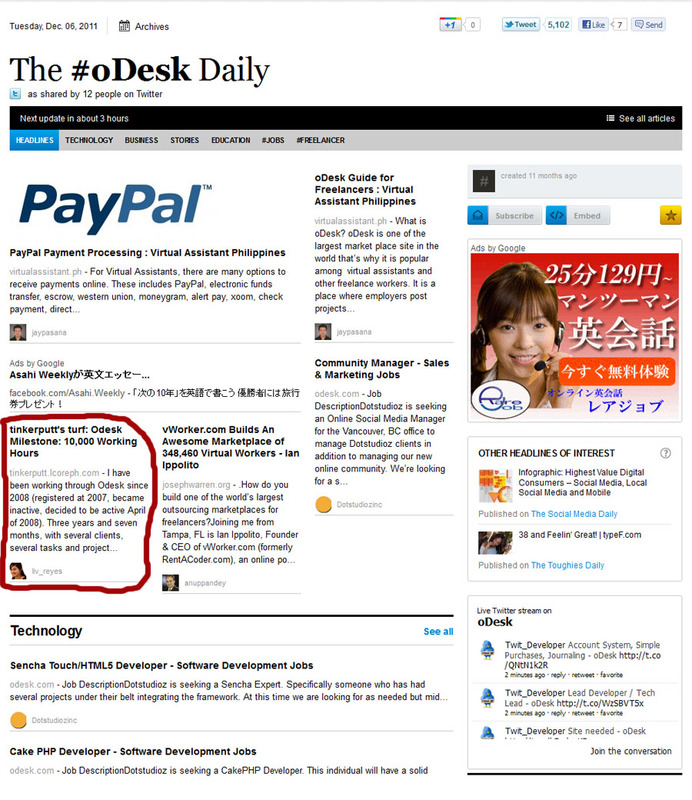 The #oDesk Daily is out! bit.ly/ecT3bf ▸ Top stories today via @ojb500 @liv_reyes @uwanja @9upconsulting @indrawdev"
I immediately visited the site , The #oDesk Daily , to see why I am one of the top stories. To my surprise, I saw my blog post about my work which was entitled Odesk Milestone: 10,000 Working Hours,it was placed just under the headline. 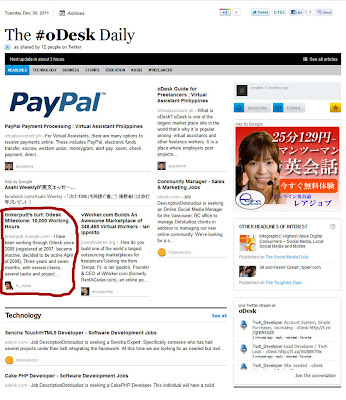 It felt great to see my post being highlighted to the online newspaper of oDesk. The post was intended not to boast about the working hours, but it was intended to be a proof that oDesk and working-at-home really works. Just like in any other work, you need to prove yourself and your work to everyone in order to succeed. Patience also played a key role for me, because without patience I might have given up on the online freelancing world. Need my services? See my oDesk profile now and hire me! Interested to earn and work at home? Join Odesk now! Droppin' by from the Bloggers Link Exchange! Paper.Li yan. It checks the lists of all the "following" of a twitter account, and looks for keywords that matches his/her paper.li account. 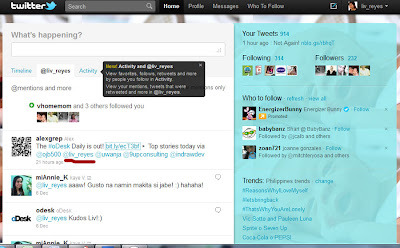 Then auto-posts it in the arranged paper.li account that looks like a newspaper. **and my gosh, these people... hindi talaga ako titigilan (commenter #1 above) sa pag-enter sa mundo ko. World is really small. Congrats thats really inspiring! I have joined oDesk but not really active.